The Modi government's $1 billion worth concessional loans to help build power plants and roads in Nepal will be a big help to Indian infrastructure companies who are queuing up to set up hydro power and road projects in the Himalayan kingdom. Some of India's biggest infrastructure companies including GMR, Tata Power, Jindal Power and Indian government owned Satluj Jal Vidyut have bid to set up projects in Nepal which has the potential to develop 42,000 mw of hydro power in the country. But Nepal has managed to develop only 600 mw of hydro power due to years of political instability and a violent change of power from a monarchy to democracy. "The biggest competitor of Indian companies is China, though India is the biggest investor till date in Nepal, it is changing fast with Chinese companies setting up a lot of power projects in Nepal," said CEO of a Mumbai based infrastructure firm asking not to be quoted. For the Indian companies, to raise funds for the hydro projects was a big obstacle and with the billion loan facility on its side, it will be much easier for Indian companies to set up projects there. Most of the power generated from these new projects is to be sold to electricity starved North India. 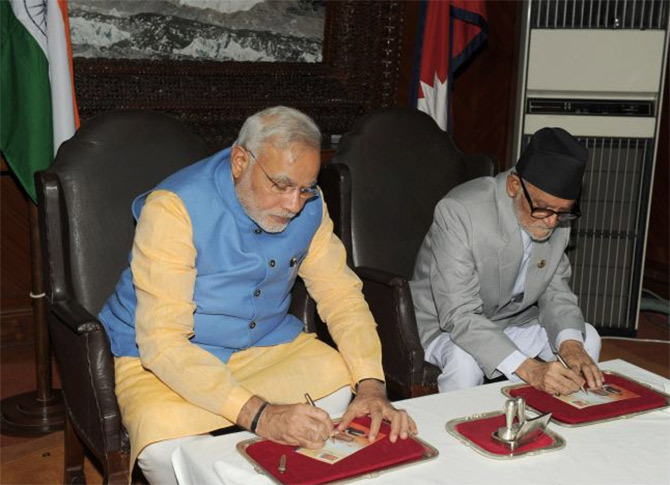 Image: Three agreements were signed between India and Nepal. Indian firms are the biggest investors in Nepal, accounting for almost 47.5% of total FDI proposals approved foreign direct investment of US $448 million, as per Indian embassy in Kathmandu. In his 2-day visit to Nepal, Indian Prime Minister, Narendra Modi announced a billion dollar (Rs 6,000 crore) concessional loan facility to Nepal to build its infrastructure including roads and power plants. "Nepal needs highways, information ways and transmission ways. India will support you in all these," he announced while addressing the Nepal parliament on Sunday. "Nepal can use this on hydropower and infrastructure projects of its choice," he said. 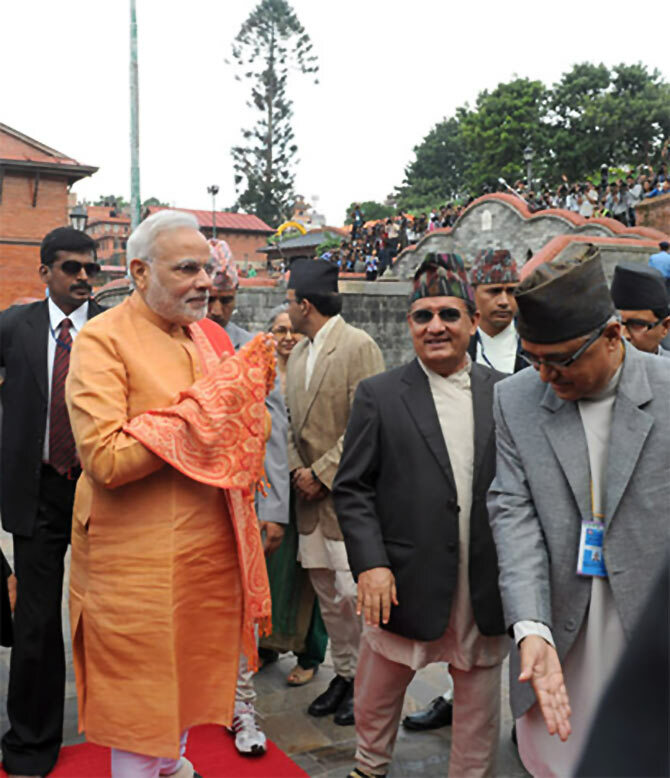 Image: Narendra Modi offered prayers at the Pashupatinath Temple in Kathmandu, Nepal. While hydro power and road projects will be the biggest driver of investments from India to Nepal, analysts say it was consumer products companies like ITC, and Dabur which have performed very well in Nepal and have earned revenues of Rs 1,226 crore (Rs 12.26 billion) and Rs 542 crore (Rs 5.42 billion) respectively in the last fiscal. "Nepal will continue to be a focus area for consumer products companies as the culture of India and Nepal are almost similar," said an analyst. A Marico official said on Monday expansion in adjacent growing markets such as Nepal, Pakistan, Cambodia, Myanmar, Sri Lanka is expected to contribute up to Rs 100 crore by next year. Image: Hydro power and road projects will be the biggest driver of investments from India to Nepal. 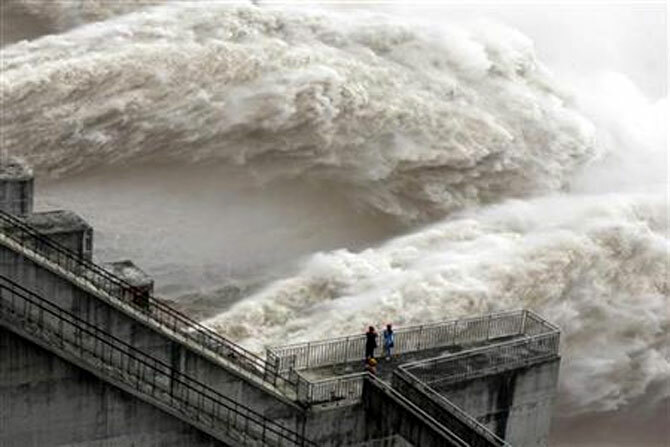 In recent years, hydro power sector has emerged as an attractive sector for Indian investments. Government of Nepal has issued 28 survey licenses for hydropower projects in Nepal having generation capacity of 8,249 MW to Indian companies, joint ventures. Apart from infrastructure projects, some large Indian investors include Tata Communications, State Bank of India, Punjab National Bank, LIC, IL&FS and the Manipal Group, which has set up a University. 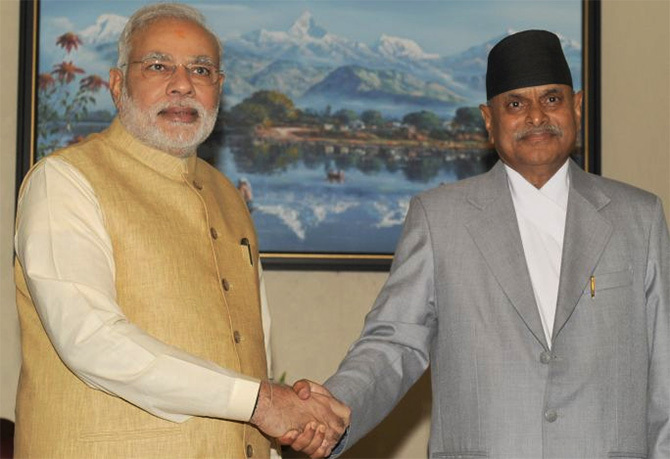 Image: PM meets President of Nepal, Ram Baran Yadav.